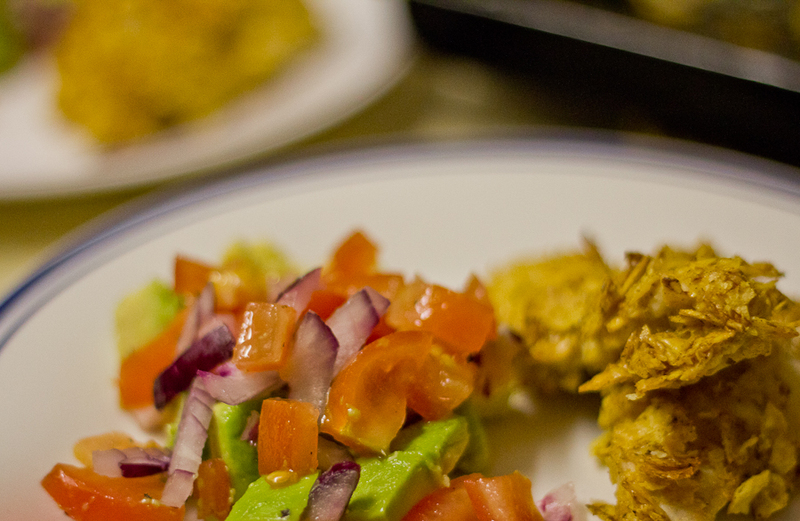 Spice-crunch chicken with guacamole salad | What's for dinner? I picked up the BBC Good Food guide Quick Suppers magazine for Autumn 2011 (honestly, they don’t sponsor me. Although if they’re reading this and want to send me large sums of money a free magazine subscription, then I obviously wouldn’t say no…) and this crunchy chicken recipe was one of the ones featured. Mondays are always a little manic- the combination of first day of the working week and the ebullient enthusiasm of our cub pack mean that I’m pretty wiped by the time I get home, so I’m always looking for something that won’t take much time, effort or brain-power but tastes nice. This was pretty scrummy and wonderfully straightforward. 20 minutes, five ingredients – win. Hey you. How’s things? Job good, settling down?? So many questions. This looks yummy. Have you sold your soul to the blog advertising devil? Must chat soon.